This work was supported by the National Natural Science Foundation of China (Nos. 21772179, 21502173, 21672192) and the Outstanding Young Talent Research Fund of Zhengzhou University (No. 1521316002). 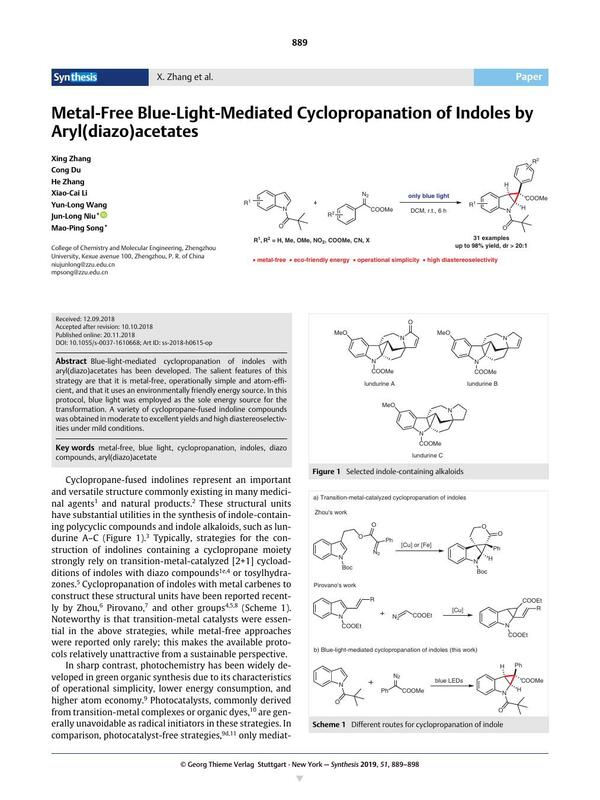 Blue-light-mediated cyclopropanation of indoles with aryl(diazo)acetates has been developed. The salient features of this strategy are that it is metal-free, operationally simple and atom-efficient, and that it uses an environmentally friendly energy source. In this protocol, blue light was employed as the sole energy source for the transformation. A variety of cyclopropane-fused indoline compounds was obtained in moderate to excellent yields and high diastereoselectivities under mild conditions. Supporting information for this article is available online at https://doi.org/10.1055/s-0037-1610668. 12 CCDC 1862501 contains the supplementary crystallographic data for this paper. The data can be obtained free of charge from The Cambridge Crystallographic Centre via www.ccdc.cam.ac.uk/getstructures.